Men's button-up shirt made of lightweight, flame-resistant twill. A comfortable option for warm work environments, this men's collared shirt keeps you safe on the job without weighing you down. At six ounces, it's among the lightest flame-resistant button-ups we offer. It's built to last from durable cotton-blend twill and features two flap pockets on the chest. Glad I made the leap to Carhartt. Preforms as it says it will. Great fit. Way too thin for the price!!! CarHartts FR clothing is what I look for when looking for the protection and comfort ability to work in a safely manner. 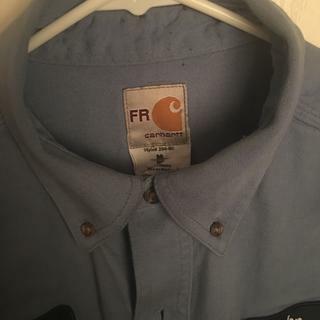 I give The FR lightweight twill a 5 star review because of my experience with CarHartt FR Clothing, working as an electrician I find that the shirts and pants are comfortable enough to let me work in a safely manner, the FR protection has proven to work every time, it is everything I look for when using FR clothing. This is a nice looking, durable, and comfortable FR shirt. I have experienced the same static cling problem that another reviewer had. The other Carhartt FR shirts that I wear do not have this problem. You might need to look into the material used for this shirt. We have reached out to the customer regarding their feedback. Very comfortable, has a solid heavy feel to it. Shirt fits great, good color. Wash well but dried with collar wrinkle. Instructions state could use iron, but the material came off on my iron. Like all FR clothing these are too hot in the summer time. Cooler than the original heavy weight cotton twill shirt however, with the nylon blend this shirt now has a static cling problem. As an instrument tech in a power plant, this is not a small problem. Also stains too easily and nowhere near as durable as you would expect a Carhartt shirt to be. As a welder welding 10+ hours a day I've burned up many shirts. I've tried every brand that offers FR clothing and heavy starch on regular shirts and I always go back to Carhartt FR shirts. Very tough and durable shirts. WELL BUILT LIKE THE CARHARTT NAME SHOULD BE. QUICK ARRIVAL TO MY HOME AND THE QUALITY IS AS GOOD AS EXPECTED FOR MY FIRST PURCHASE OF FR RATED WORK CLOTHING. VERY SATISFIED. HEAVEY DUTY CONSTRUCTION YET LIGHTWEIGHT. Are you discontinuing the royal blue color? BEST ANSWER: Yes, the royal color is being discontinued in this style. BEST ANSWER: This shirt is imported. Can carhartt add reflective strips to the shirts ? Do you have HRC 1? BEST ANSWER: This style is only offered as a CAT 2. BEST ANSWER: All of our FR garments have a 3-5% shrink ratio for the lifetime of the garment as long as it is washed according to the care instructions. So you should not notice any shrinkage. 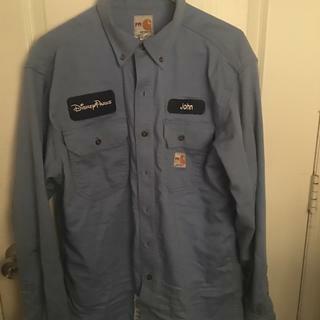 Is there a warm weather flame resistant button long sleeve option ?my company just bought us frs 003 we r in Las Vegas and these shirts are very hot ! BEST ANSWER: This style is the lightest FR button down we offer. What is the difference in the LN size and the LJ? BEST ANSWER: Please feel free to contact us at 800-833-3118 for assistance. how many washing does the FR rating last? BEST ANSWER: All of our FR garments will be FR for the life of the garment. It would only would be considered non FR if a water treatment was used on it or if it develops holes or tears. STYLE# FRS003 IS A LIGHTER WEIGHT, IT IS MADE OF 6 OUNCE, FR TWILL:88% COTTON/12% HIGH-TENACITY NYLON AND HAS AN ATPV (CAL/CM) OF 8.7 AND OUR STYLE# FRS160 IS MADE OF 7 OUNCE, FR TWILL:88% COTTON/12% HIGH-TENACITY NYLON WITH AN ATPV (CAL/CM) OF 8.6 so which one will have the least wrinkles coming from the dryer? BEST ANSWER: Because style FRS003 and style FRS160 are both made with the same blend of material, with just an ounce difference in material weight, they will perform the same. Please keep in mind we recommend to tumble dry on low and remove promptly, and iron on low heat. Is this good for welding? BEST ANSWER: No, we do not recommend any of our garments for welding. 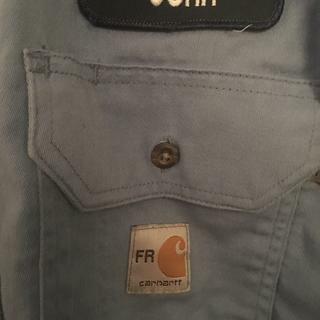 Is Carhartt able to add flame resistant logos if the design is supplied? BEST ANSWER: No, we do not currently customize garments with logos. What is the difference between the frs003 and frs160? BEST ANSWER: Style# FRS003 is a lighter weight, it is made of 6 ounce, FR Twill:88% cotton/12% high-tenacity nylon and has an ATPV (Cal/CM) of 8.7 and our style# FRS160 is made of 7 ounce, FR Twill:88% cotton/12% high-tenacity nylon with an ATPV (Cal/CM) of 8.6. He FRS003 is a cotton/twill blend rather than the thicker twill FRS160. Basically lighter weight. I love em! Not near as hot during the summer! I think the FRS003 is a lighter weight (Summer) shirt than the FRS160. One is lighter then another.